For philanthropists of the past, charity was often a matter of simply giving money away. For ‚philanthrocapitalists‘ – the new generation of billionaires who are reshaping the way they give – it’s like business. Largely trained in the corporate world, these ‚social investors‘ are using big-business-style strategies and expecting results and accountability to match. 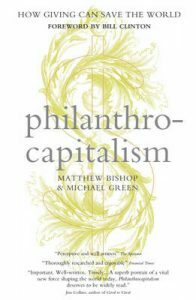 In Philanthrocapitalism, Matthew Bishop and Michael Green examine this new movement and its implications. Proceeding from interviews with some of the most powerful people on the planet – including Bill Gates, Bill Clinton, George Soros, Angelina Jolie, and Bono, among others – they show how a web of wealthy, motivated donors has set out to change the world. This paperback edition includes a new foreword by Bill Clinton.